"If one candidate’s trying to scare you and the other one’s trying to get you to think, if one candidate’s appealing to your fears and the other one’s appealing to your hopes, you better vote for the person who wants you to think and hope." Clinton has become extremely detailed in his plea for voter turnout. "If you vote early or you vote on March the 4th in the popular election, 65 percent of the delegates will be selected to the national convention. But 35 percent of the delegates for the national convention will be selected Tuesday night, March 4, at 8000 Percent Convention all across this state," Clinton told the crowd in Killeen this morning, adding, "The doors open at 7 and they close at 7:15. It would be tragic if Hillary were to win this election in the daytime and somebody were to come in at night and take it away." Before that, I'd been talking to the woman you see at right. Earlier, she'd been holding a Hillary sign. Been waving it around, very proud and happy to support Bill's missus. Then another Clinton campaign worker walked up to and said, "Excuse me, would you mind holding this sign instead?" She then handed the woman the handmade sign that reads, "This one's for Ann!" "Ann Richards," said the dark-haired Clintonista, shielded by dark, large sunglasses. "Oh, sure," said the woman, smiling but not totally into it. "This way," said the campaign worker, "the cameras are behind you, and they'll be able to see the sign when the president speaks." She then walked off, only to reappear later in the role of cheerleader while the crowd waited and waited and waited for Bill to show. "I should have told her I get paid by the hour," said the woman to her friends. She asked others around her, "Anyone else got any signs they want me to hold? 'Eat at Joe's'? I only charge five dollars." I've read the commentary out there I can't fathom how people are missing what I see as the major point: Clinton was not Presidential. She was inconsistent in her persona. She was clearly flustered at seeing those clips played of her three different personas, and she should be. I don't think that works in Ohio. One thing about folks in the central part of the country, in my view as a midwesterner, is that midwesterners value civility and are circumspect, if not dubious, about attacks. However, that doesn't mean attacks aren't fair game, you just need to be consistent in substance and tone. That is, if Clinton is going to be upset about something, or make fun of something, then she sure better have a good reason for doing so, because you don't want to make a big deal about something in public one day and then not make a big deal about it the next day. If you are a politician and make an attack in the midwest, your supporters are expected to sign on to that attack....now, I think that's true all over...but especially in the midwest where you kind of personally endorse your candidate and hence your candidate must be able to fit into your public persona. "I'm for Hillary." "I'm for Barack Obama." Consistency, then, in political personas is highly valued in Ohio. What one personal quality, among other factors, allowed Bush to win in 2004? What personal strength did he have? Exactly that. If he got angry about something, and he did, he stayed angry about it and had reasons to explain why he was angry about it. If he said something one day, he kept saying it the next day. George W. Bush is actually quite good at that. (Horrible president.) If he made an attack, he stuck with it. If he made a joke, he didn't back down. Bush the candidate always gave his supporters someplace to hang their hat. Clinton's complaining about the debate rules is a big deal in that context. It means, implicitly, that if you vote for her in Ohio you are voting to endorse complaining about the rules. That has real implications in people's every day political lives. You go to your hair dresser or your drugstore now and say you support Hillary, it means you have to stand by her complaining about the debates, complaining about the media, complaining about the mailers. I think that's just a very big deal. I think comments making the point about Clinton having a path to the nomination through a combination of Super Delegates and a MI/FL play make a fundamentally erroneous assumption. They discount what's already happened. A 64% Obama win in Virginia sweeping almost all demographics. A 58% Obama win in Wisconsin sweeping almost every last demographic. Decisive Obama wins in crucial "Clinton friendly states" like Maine and Washington. Clinton won't win the Super Delegates without winning the Pledged Delegates for the same reason Clinton won't add MI/FL without winning the pledged delegates (which determine who controls the credentials committee): enormous political pressure is coming to bear and will come to bear inside the party that the Pledged Delegate count and the process so far be respected. It may fit "prognosticator fantasies" to leap from some version of a TX/OH "outcome" to Clinton securing Super Delegates and MI/FL to take the nomination in August. We don't leap to an endgame. The results in the states matter. The day to day process matters. For Clinton to win the nomination would involve winning pledged delegates and winning states overwhelmingly and using that leverage to win over Super Delegates over a sustained period of time and a map of remaining states that simply do not favor her. Frankly, her performance post Super-Tuesday, especially the results in WI and VA have set the bar extraordinarily high for Senator Clinton in TX and OH. She must win big. The pressure on her campaign right now, as we speak, is enormous. Ignoring that is a fantasy. Certainly it is her right to stay in the race , but at some point after eleven decisive losses with no prospect of a decisive win on the horizon this extended primary is draining resources and energy from the larger task of the Democratic Party in 2008 which is wrestling the mantle of governance from the GOP decisively in all levels of government. Yes, in theory, Clinton has a path to the nomination. In practice, barring some debate debacle, the real story is that it is only a matter of time and judgment before Senator Clinton acknowledges the current reality: Senator Clinton has no path to the nomination that does not run counter to the spirit of fair mindedness, the principles of our party and, most importantly, the clearly expressed will of the voters in 2008 in State after State. This is a BBC article about United States Senator Barack Obama serving our country and representing our nation in Africa. As part of that trip, Senator Obama and his wife, Michelle, took a public HIV test to raise awareness of HIV testing in Africa. It was an effort to save lives. 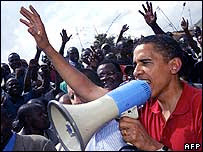 Mr Obama walked through rubbish and sewage as he toured Kibera, the slum home to at least 600,000 people, many without jobs or legal title to the land they inhabit. He told thousands of cheering admirers that he would tell Americans about their troubles and lobby for more help. "Everybody in Kenya needs the same opportunities to go to school, to start businesses, to have enough to eat, to have decent clothes," he said over a loudspeaker. Mr Obama visited micro-finance institutions - which pool members' resources to provide small business loans - a women's self-help group, and Carolina for Kibera, a project run by the University of North Carolina to raise awareness about HIV and Aids. On Saturday Mr Obama and his wife Michelle took HIV/Aids tests at Kisumu, which has one of Kenya's highest rates of HIV prevalence, to encourage local people to do the same. Kibera lacks almost all government services, including water. The videos below won't play. There's some talk of a DNS problem or hack, which may have happened to Google before. Hillary Clinton: "Shame on You"
"Enough with the speeches and the big rallies and then using tactics that are right out of Karl Rove's playbook. This is wrong and every Democrat should be outraged...Shame on you, Barack Obama." I've encountered so many barbed comments on the blogs that I want to address a couple ways in which I like and respect Senator Clinton. First, a month ago I wrote two long pieces on Senator Clinton that describe my take on her career and my critical but respectful view of her campaign. Senator Clinton, clearly, has been a powerful advocate for women, children and families for her entire life. She is and has been an agent of change as a woman and a political advocate. This is a consistent theme; it's real. Her work, after being appointed by President Carter to the board of the Legal Services Corporation, defending that organization from Reagan's budget cuts and mission change, was exemplary. Few knew who she was at that point; no one was looking. She took that stand because of her core values, period. It wasn't about glory because...well, because, even now Senator Clinton has never received proper credit for her role in preserving the organization in its true mission. Further, Senator Clinton's work over long years with the Arkansas Education Association was, from what I've read, fruitful and had a profound impact. People who say that Senator Clinton left a mark on Arkansas...as she is now leaving a mark on New York State...are credible, in my view. Her speech at the Women's Conference in Beijing was powerful and bold; it deserves more attention than it has received this campaign season. Senator Clinton's advocacy for Senator Kennedy's S-CHIP bill and her recent amendment of the act to extend its benefits to wounded veterans were remarkable and signficant. Senator Clinton is, in this regard, exactly what she says she is: a tireless advocate for women and children and basic issues that confront citizens who are not powerful and do not have a voice in our politics. It is no coincidence that her most solid bloc of voters are senior citizens and that her advertising can be seen to subtly skew towards them. Her campaign has done a good job conveying its concern for voters on a fixed income. That is relevant to her sucess. I guess what I'm saying is that Senator Clinton's campaign, on one level, does not get credit from something that is apparent to someone who delves into her supporting material. Senator Clinton has a consistent track record of caring and advocating for those without much political power. Her line about the wounded veterans at the last debate was powerful because it was real. She, in my estimate, truly is that person, she was being sincere. The overarching theme of caring is why Senator Clinton is involved in politics and it is consistent theme over her 35 year career in public service, law, as First Lady and as a United States Senator. Clinton dismisses Voters / States: "They don't represent the electorate." Hillary Clinton on Monday explained away Barack Obama's clean sweep of the weekend's caucuses and primaries as a product of a caucus system that favors "activists" and, in the case of the Louisiana primary, an energized African-American community. She told reporters who had gathered to watch her tour a General Motors plant here that "everybody knew, you all knew, what the likely outcome of these recent contests were." "These are caucus states by and large, or in the case of Louisiana, you know, a very strong and very proud African-American electorate, which I totally respect and understand." Clinton has publicly dismissed the caucus voting system since before Super Tuesday, seeking to lower expectations heading into a series of contests that played to Obama's advantage. His campaign features what many consider to be a stronger and more dedicated grassroots organization than Clinton's. Noting that "my husband never did well in caucus states either," Clinton argued that caucuses are "primarily dominated by activists" and that "they don't represent the electorate, we know that." That's just an unfathomable comment in my opinion. Washington, Nebraska, Louisiana and Maine form a miniature version of the early primary states. Clinton did not merely lose those four states. She lost them by huge margins. Now she is apparently dismissing the votes of African Americans in Louisiana as well? A primary state that suffered the brunt of Katrina? That is a hugely problematic move for Senator Clinton. Hillary Clinton talks about her husband. He would never have dismissed Black voters in that way when he was running in 1992. Bill Clinton won a plurality of the vote in 1992. African-American voters made up roughly 1-in-5 voters for Bill Clinton in the general election, or 20% of his total votes. Most significantly, African-American voters in Georgia (13EV), Ohio (21EV), New Jersey (15EV), Kentucky (8EV), Wisconsin (11EV), Louisiana (9EV), and Tennessee (11EV) provided the crucial margin of victory in states Clinton won by less that 5%...states worth 88 Electoral College votes. If you include or Maryland (10EV) and the District of Columbia (3EV) or, arguably, Michigan (18EV) you could argue that African American voters provided Clinton with his entire margin in the election. For Senator Clinton to dismiss those voters, or any voters really, as a bloc today is utterly problematic. Regarding "activists" it is equally dire rhetoric from Senator Clinton. The Democratic Party needs activists, not simply in the general election but for all the closely contested House and Senate and state legislative races we are facing in the fall. That's precisely how we won in 2006. If Senator Clinton cannot see that the "new activists" Barack Obama has brought into the process in places as widespread as Maine, Minnesota, Colorado, Nebraska, New Hampshire, Washington, Iowa, Nevada, South Carolina, Georgia and Missouri then, quite simply, the Senator from New York does not deserve the nomination to lead our party. The Presidential nominee is the top of our ticket, the putative leader of our party. You cannot, cannot dismiss African-Americans and activists the way Senator Clinton just did and expect us to run strongly in the fall in ALL of our races and states. Senator Clinton did not just create a strong argument against the voters granting her the nomination of our party for president, she has made a devastating argument against her claim to lead the party into the general election next fall. Nothing for certain, but these are the anecdotal reports that people are looking at. HorsesAss has a wide sample of comments from caucus goers in Washington. * Mike Huckabee visits patients at Walter Reed Army Medical Center in Washington, D.C.
Yep, you've read that right, Bill Clinton has more events today...all told four...than Huckabee, Obama or even his spouse. Bill Clinton is and has been the real story of this campaign season and his aggressive campaigning for a 3rd term in the White House is still a solid reason to look elsewhere for a Presidential nominee. He won't go away, he's right back on the trail, and that has real repercussions on a host of levels, including the non-transparent finances that are self-funding Senator Clinton's bid for the White House. I spent the final five days in a sprint working out of Obama Headquarters in Oakland and blogging on Dailykos. The last two days, Monday and Tuesday, I worked as a precinct walker for Barack in West Oakland. I was responsible for door knocking, calling, lit drops and making sure that as many people as I could contact from my list of 77 got out and voted for Senator Obama. Final tally: 45 votes for Barack Obama voted at the polls 2 for Clinton 3 Would not say on principle and 27 I never managed to contact. Not too shabby, eh? At any rate, I was also featured doing GOTV at West Oakland BART station on MTV Street: scroll using the button on the right till you see the preview with the guy with red vest...me. Now walking the streets at 5:30AM leaving door hangers is not anyone's idea of fun but the experience was unforgettable. I would like to salute here, every last one of the people I contacted however they voted and the community of West Oakland for showing such strong spirit and unity on primary day. The neighborhood surrounding West Oakland BART station is one that most Bay Area riders have seen from the window of the train, but few have visited. I spent two days walking those streets and meeting so many residents of this community. I caught a glimpse of lives marked by hard work, a dangerous locale and quite frankly, a powerful pride. I can only offer my respect for the spirit of that precinct and the voters young and old, who got out the vote for Barack Obama. Now, regarding our loss in California. That is real. We lost. I can only offer respect for the Clinton campaign, especially for their results in Santa Clara, San Mateo and San Joaquin counties. I am energized by the surge in youthful Latino voter participation even if it didn't go our way. However, all the votes have not been counted, including, I know, many from people I contacted in West Oakland who walked their absentee ballots to the polls. I will write more about what's next for Senator Obama and my analysis of the vote on Super Tuesday. What a great video to inspire for this weekend. "You know, you can't always pass the laws you want to pass right away. You can't snap your fingers and get people to cooperate. You have to work on that every minute of every day. But you can try to help somebody every single day." On the afternoon of the New Hampshire primary, I had a political epiphany of sorts while standing in line at the Kaiser Permanente Medical Center in San Francisco waiting for a prescription to be filled. In front of me, a middle-aged woman in a sensible pantsuit was soothing her rattled, elderly mother. "It's OK, Mom, they made us go to the end of the line because I didn't wait until your name was on the board, but you don't need to stand. Sit down and relax, and I'll handle it." In the row of chairs to my left, another woman in business wear -- she'd clearly just run in from the office -- was applying similar verbal balm to her fretting parent. "That's not a problem. I'll call the doctor and make sure he understands that, and then I'll move that other appointment to tomorrow morning. Don't worry." A pitched cellphone battle with the doctor's recalcitrant gatekeeper followed. Evidently, the daughter won. "It's fixed," she told her mother. "I've taken care of everything." Listening to these women manage their mothers with effectiveness and as much patience as they could muster, admitting to errors, standing in interminable lines, speed-dialing medical professionals, I wanted to ask, "Could you run my country?" Help, in that sense, the help that Clinton provides, is managerial competence that appeals to women AND to seniors. Faludi was clearly onto something. And that ad is clearly designed to appeal to those core groups. That is Clinton's enormous strength in this primary since seniors and women are the two demographic groups that participate strongest in the Democratic primary season. However, that being said, I don't see how this ad helps Clinton break out of that demographic box, how it expands her appeal in any way. "Ready to Lead" has become "Trying to Help." In that sense, "Lifetime" defines in some ways the strengths and limits of the Clinton appeal. Will that appeal be enough for Clinton to withstand Obama's ground game and expansion of the Democratic primary playing field across demographic and regional lines on Tusnami Tuesday? We'll see.